Recently, I re-stumbled on the idea of literate programming while leveling up with the Babel project (part of Emacs’ org-mode), and thought I would share my perspective (and some of my tools). 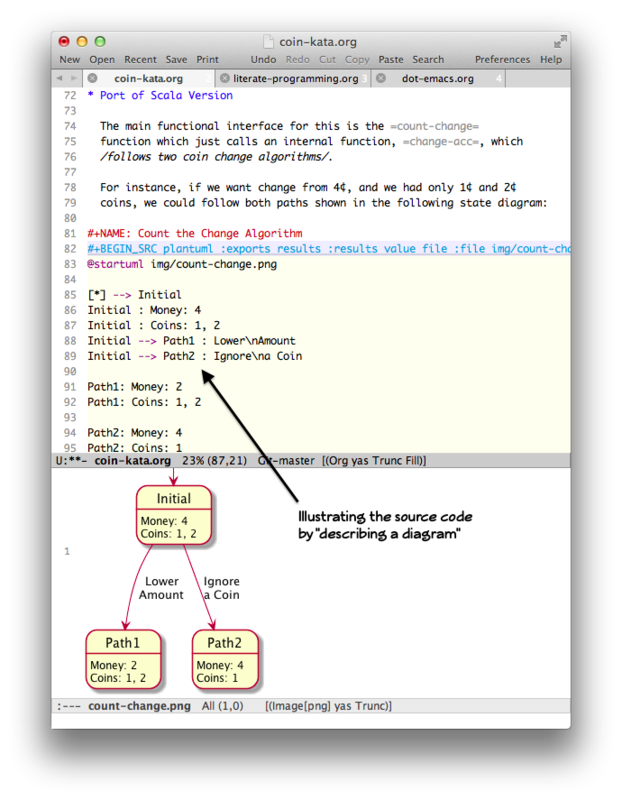 After introducing the concept in a white paper, he explained it by publishing an example of how the source code would be written. Essentially, you describe your program in prose with inserted bits of code. 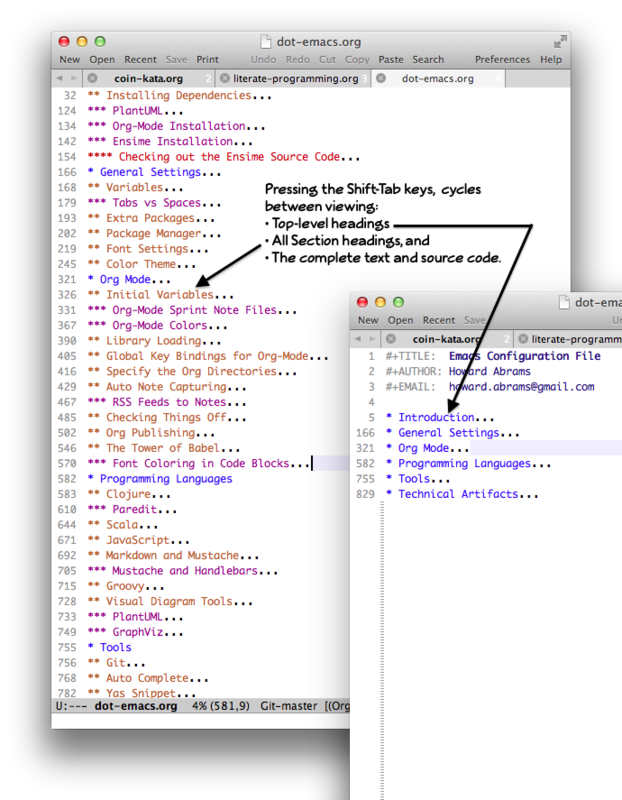 A macro program would then write the code blocks out into a source code file (called tangling) and create a published document of both the prose and the code formatted for reading (called weaving). What happened to his concept? Perhaps this process was a bit too much writing for most engineers, who view code comments as unnecessary, oversized baggage that needs to be maintained. However, Java’s Javadoc, Doxygen, Docco and other similar projects that can extract an API from the comments of the source code could be viewed as a step toward literate programming. Haskell has a partial implementation built into the compiler so that it doesn’t require a special comment syntax or an external macro system. What most of these systems lack is that the code, not the logic, drives the presentation order. For instance, many languages require imports, variable definitions and functions to be declared before they are used. Knuth’s original “WEB” program allowed a code block to refer (include) another code block in no particular order… you could describe your code in any order that made the most sense. However, any sufficiently complicated problem or exploration could benefit from an LP approach. Consequently, I have found that using Emacs, with org-mode and its Babel project is nearly ideal. What does it look like to work this way? Code blocks can be executed/evaluated directly in the file, and the results can be re-inserted as “text” back into the file, which can then be assigned as a data variable for another code block…which may be code in a different language from the first. Many people have talked about the Coin Change Kata, as a way to practice our coding craft. I thought it would be fun to try it in a literate way, and this is the results. I suggest viewing the tangled web page first. 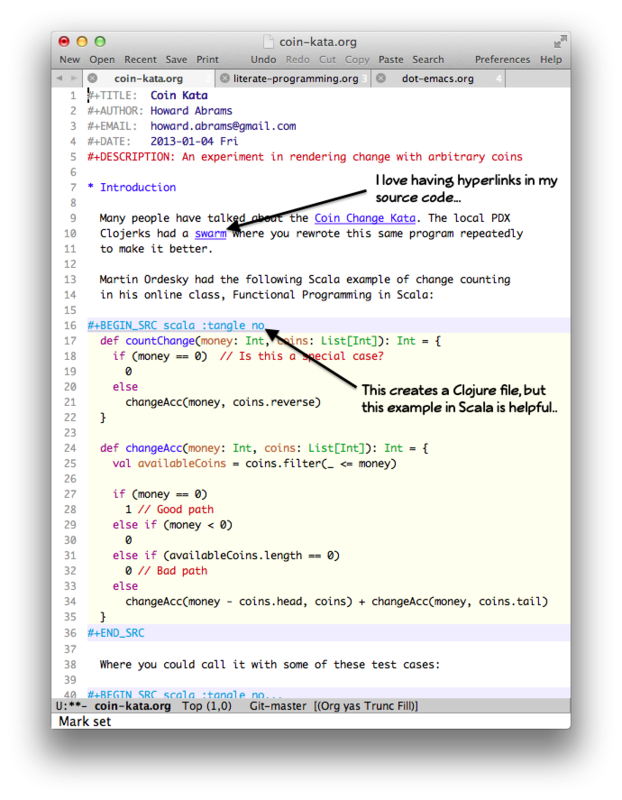 In this example, my literate file included both the solution code as well as the tests (having them side-by-side like can be informative). The tangling process separated it into two separate source code files. Should all programs be written in such a style? A wise engineering solution would produce—or better, exploit—reusable parts. His example proved his point. However, given a complex problem without the necessary components, perhaps composing your initial solution in a literate program is helpful? Where have all the Literate Programmers gone? If you understood this paragraph, you would have achieved a sort of literate programming satori, however, I doubt that my prose sufficiently explains this concept. Check out my essay on Literate Devops for better examples.